When I think about God splitting of the sea I’m reminded of the story of Joey who when asked by his father what he learned in Sunday school explained that Israeli engineers laid pontoons across the sea so that the Israelis could cross over safely, attack the Egyptian army and win the 1973 Yom Kippur War. Then Joey told his father that the same Israelis snuck back and laid charges under the bridges so that as the Egyptians crossed the bridges, they exploded and the Egyptians drowned. To children and adults alike, the parting of the Sea of Reeds in the Exodus story is incredulous. What to make of it as it defies reason? Wouldn’t a more relevant liberation story be Lincoln’s Gettysburg Address, Kings “I Have a Dream” speech, Natan Sharansky’s address to the sentencing Soviet court, or Israel’s Declaration of Independence? The Kotzker Rebbe said: “Whoever believes in miracles is a fool; and whoever does not believe in miracles is an atheist.” Is there no middle ground? How ought we to read the Exodus text? Nachshon ben Aminadav, a little known figure in the Exodus story, took matters into his own hands and as the Egyptians advanced and Moses prayed Nachshon jumped into the waters and started swimming. 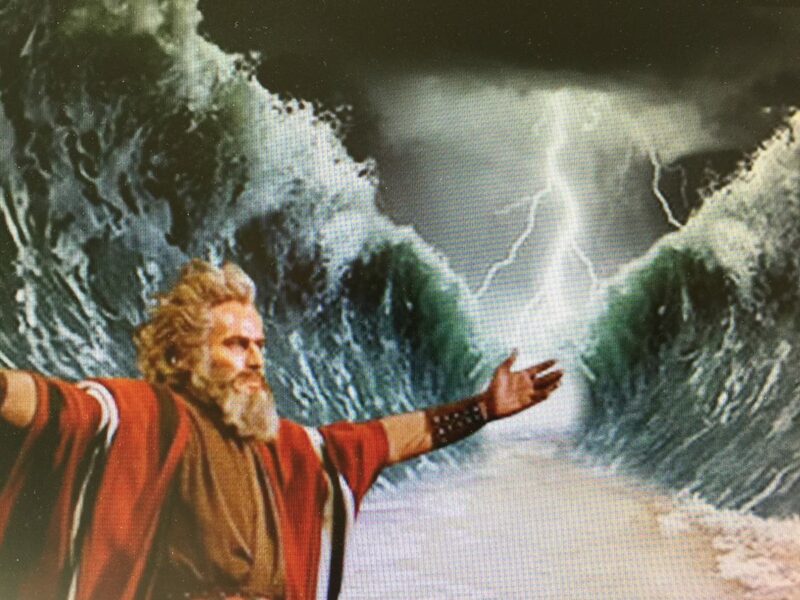 The Midrash says that Moses’ faith and Nachshon’s activism persuaded God to split the sea. So – what’s a miracle? Philosophers answer the question in the negative; what isn’t a miracle? Judaism teaches that a miracle isn’t the radical transformation of the natural world. Divine wisdom and goodness lie not in rupturing God’s reign of universal law, but in the reliability of the steady order of the world. The pagan asked how he could make such a claim. Akiba brought sheaves of wheat and loaves of cakes and asked, “Which are superior?” The great sage answered his own question: the loaves of cakes excel because they required a human being to take the wheat and make something life-sustaining. The lesson of the Sea of Reeds isn’t in the splitting of the Sea. It’s in our conscientious capacity to take action and transform the world. As we prepare Pesach this week, our nation’s teens marching for reasonable gun control this past week is a great example of how we humans can transform ourselves and our world. Thank you, once again, for sharing the wisdom of the past and finding hope in the present.